Suitable for vegetables Roll meat Sushi etc. Material: Food grade Plastic Size: (L x W x H) 35.4 x 8.5 x 4.5 cm / 13.9 x 3.3 x 1.7″ Color: White and blue Features: Perfect roll-sushi maker equipment food volume tool Making the sushi or roll the food without trouble Plastic material, durable and easy to wash Best helper for kitchen supplies Suitable for vegetables Roll meat Sushi etc. 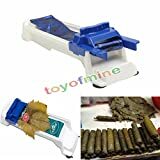 Package Include: 1 x Food Roller for wrapping dolma, stuffed cabbage Instructions: Place the roller on a flat area. Put the grape or cabbage leaf on the sheet and pull back a little with your fingers. Spoon other stuffing on the leaf. (The amount of stuffing is based on required thickness. Too much or too little of the stuffing may complicate the function.) Move smoothly the slider at the forward position. Your stuffed leaf will be ready to be cooked. After using, wipe the roller with soap and rinse with water. No dishwasher. Please make sure it is dry before storing. Please note: Manual measured size. Please allow 1-2 cm deviation. Picture is for illustration purposes only. Actual color in your pack may vary.